The Last Hope armor rules are getting an update/tweak in version 1.5 . Goal: To change the scale a bit so that armor is still easy to get for the first few points, but to begin getting more substantial armor points then you need to pay more attention to better/more complete coverage and not necessary just the type of armor. The scale should be a bit harsher on partial armors and a bit more rewarding on more complete armors. Given the fact that our armor system is an abstract way to portray cuts and strikes being turned into incidental damage or grazes due to the quality of armor, the amount of coverage becomes just as or possibly more crucial than the quality of the armor. The intent of armor to “downgrade lethal or damaging strikes into non-lethal or non-severe strikes” instead of “effectively blocking or stopping the entire damage from an attack” is important to keep in mind. Armor is not meant to represent the ability to take blows without damage, but the ability to turn aside or downgrade blows until enough have landed to produce results. The armor system must be simple to count and easy to remember so that armor can be counted on the fly. •	Layering goes away entirely or instead upgrades to the next armor category or helps upgrade coverage instead of adding more points. Needs to be balanced. Layering is not as effective for armor as overall coverage is. •	More focus on complete coverage and dedicated armor for higher points, less ability to “cheese” min/max armor. •	Larger emphasis on full proper armor with the “Full Armor” bonus going up based on the category of armor that covers you. This system splits armor into BASIC AND COMPLETE COVERAGE. Basic = 50% or more coverage. This is how the armor rules are currently. Complete = 66% or more coverage and adjacent joints (hand, elbow, shoulder, hips, knees, feet) covered. For complete coverage of a helm, the neck and face protection is factored into this. For a complete coverage torso, a backplate is factored into this. Armor is separated into CATEGORIES; Garment, Light, Medium, Heavy, similar to what we have now in the 1.4 rules. This makes it easy and allows us to incorporate all sorts of armor grades and materials. The MAXIMUM ARMOR POINTS in this system is 18 points. This could potentially go up to 20 if we need to in order to scale the armor appropriately, but we would prefer to keep the ceiling at 18. We will keep the bonus for FULL ARMOR BONUS but potentially changing it to a "Set Bonus" instead. This is to heavily encourage full sets of armor. 1) If you have full (all 10 locations) covered in armor of Basic coverage, you get +1 armor. If it is Complete coverage, you get +2 armor. 2) You get a "Set Bonus/Full Armor Bonus" based on the type of armor (+1 for light, +2 for medium, +3 for heavy). HELM bonuses will remain the same, downgrading Waylays to only Stun instead of Knockout. MISSILE PROTECTION will remain in the armor rules but will need to be tweaked. Does Basic Heavy downgrade missiles? Or do you have to get complete coverage? Or is basic on the limbs and complete on the torso and helm needed for the bonus? It will need tweaking. GAMBESON worn under armor will still give you +1 armor point. Unknown if gambeson padding underneath armor will be needed for the full armor bonus, we are assuming so. Now, with all that in mind, how do we go about calculating out the armor so it factors this stuff in but is still easy to do? That is the current obstacle we are facing. There are currently several different systems we are looking into that could help us calculate this out. I will post replies with file examples. Here is one idea that changes the armor system to this new format for you to review to at least explain one method for understanding. This means full basic light armor would give you a max base of 4 points of armor and full complete light would give you 7. Depending on the gambeson and full set bonus rules, this could go up by 2-3 points. This means full basic medium armor would give you a max base of 6 points of armor and full complete medium would give you 8. Depending on the gambeson and full set bonus rules, this could go up by 2-4 points. This means full basic heavy armor would give you a max base of 8 points of armor and full complete heavy would give you 14. Depending on the gambeson and full set bonus rules, this could go up by 2-5 points. In this example above, there is a small step-up between Light and Medium armor and big step-up between medium and heavy armor. This worked in the past because of how we factored in layering armor; it kind of filled in that gap between medium and heavy a "layered medium" point range. If layering goes away or it factors more into complete coverage, then this gap / unbalanced scale has to be looked into. This armor is from Skyrim. It has a fair amount of pieces to it, but if you examine it closely you can see that this is definitely more for show than functional armor. The bracers do not protect the hands or elbows, the pauldron is a single piece that is small, the torso is light leather (like a jerkin/vest) instead of decent armor, the legs are hide and studded leather reinforced, and the greaves are small and do not cover the calf/knee/foot. Although neat llooking, there are huge gaps in coverage that should be factored into how armor works. This picture is a great example of "adventurer/LARP armor". As you can see, the bracers are standard bracers with no albow or hand coverage, the torso seems to have a small breastplate on it, and the pauldrons are very small and do not cover the armor well. Armor like this would be very easy to defeat in combat as the huge gaps would be taken advantage of. Something like this should really only award 1 point or 2 at best, due to coverage. This armor (is super fancy and) is getting closer to being dedicated fighter armor. The helm is full as it protects the face, the torso has a full breast/backplate and the pauldrons are large and long, going all the way to the elbow. The tassets seem to be large and long, covering a big chunk of the legs. The bracers, however, are short and do not cover the hand or the elbows. This is armor that should get decent points but still factor in the gaps of some of the missing pieces, but not by much. 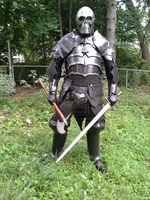 This armor is another great example of "adventurer/LARP armor". With the small bracers and basic greaves along with a breastplate, you could expect the armor to maybe help turn a sword cut or two, but due to the gaps in armor it would be very easy to avoid and cut flesh instead. Something like this should only be 2 points of armor. This armor is a great example of dedicated fighting armor. All locations are covered including the joints; knees, elbows, wrists, shoulders, etc. The face is fully covered as well, meaning that landing a blow anywhere on this fighter's body would result in most likely hitting armor. This is the type of armor where a fighter is getting into the complete coverage and higher end points due to overall body protection. All 3 of these red warriors are great examples of full armor too. They have joints covered such as the wrists, elbows, and knees. Their armor is full and complete, meaning a vast majority of their body is covered in armor. This would be an example of a warrior who is getting up there in armor points due to the coverage (and also the type). This is a great picture because it shows two vastly different types of armor. The two warriors in the front are decked to the hilt. Full plate, tons of coverage, lots of armor. This is what a top-tier/top-armor-point armor would look like. There are still some gaps, but they are covered by add-ons or small enough to not be factored in as much if we use the 66% coverage for complete armor. In the background, you can see two soldiers with more basic armor. They appear to have kettle helms and maybe a gambeson, so they would be coming in at about 2-3 points of armor (2 for helm, 1 for padded/garment armor). Here we have an example of a dedicated fighter. Base of chain, layered leathers, gambeson underneath, knees and albows covered. The hands are not covered and nor is the head, reducing the potential of the armor. In this proposed system, a fighter like this would be at 8-9 points for the chain/plate combo. This could shoot up to 10-13 depending on how we add-ons and what kind of helm would be added. 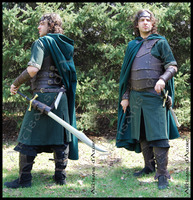 And lastly we have a very common and popular type of armor used by a lot of LARP players. This is good armor, but when you break it down there are some serious coverage flaws. The bracers and greaves are small and do not cover points. The tassets are short and not long enough to protect the thighs. The pauldrons are good but they do not protect the elbow. The entire set weighs only about 20-25 points. Currently in version 1.4, this armor clocks in at 10 points of armor (11 if you add gambeson). For the lack of coverage, it should not be as high. In the new system above, this would be 3 for complete torso, 2 for complete pauldrons , 1 for basic bracers, 1 for basic tassets, and 1 for basic greaves, for a total of 8 points (9 with gambeson). Had the greaves, bracers, and tassets been complete it would jump up to 11 points (12 with gambeson). Something that's been on my mind for awhile: I've always found it strange that without proficiency you either don't get any benefit from armor, or something is outright preventing you from putting it on in the first place. This is problematic for characters that have purchased expensive real world equipment for cosmetic or roleplay purposes but might be a little short of the exp needed for say... improved armor to wear their fancy helmet. This could be the case in a faction establishing a uniform that happens to include said helmet. 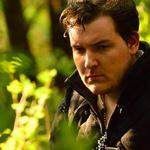 There are also instances of roleplay angles where a player might deliberately be strutting around in heavy armor that their character or NPC has no idea how to use, which I believe should be represented in the mechanics (but by no means be an effective choice). Imagine a flamboyant aristocrat trying to look fancy or important and wearing a decorative chest piece but having no real combat training or skill to actually use it, this is something that almost certainly happens on occasion. I'd like to propose a severe non-proficiency penalty for the 1.5 armor rules, to replace the inability to use armor without the proficiency at all. How it might work would be that while you would be allowed to wear any armor, if you are not profiecent in that armor you would only receive a fraction of the protection it would ordinarily provide. Perhaps even less then you would receive then wearing lighter armor you actually are proficient with. Mechanically I don't see an issue with people being less protected then they appear. You can already walk around with damaged armor which has no visible que to indicate the reduced number of armor points. I'm going to it my two cents in here: I am not a fan of the new system since it adds more complexity and subjectivity into the judging of armor points. If we wish to get away from the "larp" style armor, bumping the coverage to count as a piece of armor from 50% to 66% (or 2/3) would bring fuller coverage. Currently, the system allows for easy free points of armor: a gambeson on the torso, and a pair of bracers would give 2 points. Add greaves and a chest piece, or helmet and that would give you 4. Really it's once you get past 6 or more you have to look at heavier materials or skills. I am going to "breath some more life" into this thread to get the discussion going on concrete ideas for our armor rules. With the 1.5 rules launching, we finalized the armor rules, put them in front of people, and playtested them. After some solid time in the system, we have been able to get a decent amount of feedback. Our current system allows you to "build your armor" much better than previous versions. Partials, half coverage, modified pieces, and unique armor types are covered well. We also preserved the "helmets matter" and "bypass protection" aspects of heavier armor. Layering is gone, but "layered armor" is still subjective. Although the "equation" is much more robust and covers more, it is much harder to understand and a majority of players (including staff) find it very difficult to understand the armor rules. This leads to errors and misunderstandings on trying to count armor. I am attaching a document here that focuses on just the version 1.5 armor rules. This will allow everyone the chance to review the armor rules quickly. I am also going to quote the version 1.1 armor rules so that you all can see the "origins" of the armor system. Armor gives a player the ability to soak up more damage in combat. Damage taken is applied to armor first and it does not matter if you are struck on a location that is armored or not. Damage is applied to an overall pool of armor and is not location based. If you are wearing a metal helm and get struck in the leg, you can still call armor. Although not completely realistic, it creates a very easy damage tracking system for fast paced combat. If you take a valid hit in combat and it damages your armor points, you MUST announce “Armor” so your opponent knows you counted it. All armor must be checked prior to being used and 2/3 of the base layer (torso, upper arms, upper legs) must be covered to get the full armor bonus. Half armor or combo armor will be evaluated by a game organizer. When enough damage has been dealt to overcome the number of armor points granted by armor, the armor is considered “broken” and must be repaired by either a skill or blacksmith before it can afford further protection. If you have partial damage to your armor and you change or drop pieces of that armor, your largest piece of armor is considered damaged first. For example, if you are wearing a metal helm (2 points) and a partial heavy leather breastplate (2 points) and you have taken 2 points of damage, then your breastplate must be repaired. All metal armor should have dull edges and follow the "penny round" rule... all points and edges must be larger/smoother than a penny. All metal edges must be rolled or curled. This is to ensure safety of players and for the longevity of weapons. Also, areas on the armor will be checked for finger catching. If someone’s finger could be caught and twisted then the armor might fail. Any spikes on armor should be made from foam, latex, leather, or other softer materials but must still look the part. The game organizers have the final say as to what could be considered unsafe armor and measures should be taken to make armor as safe as possible. You cannot use synthetics, cardboard, plastic, etc. You cannot use sporting gear, like hockey pads, that have been repainted. 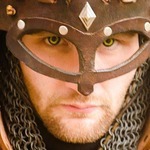 This means that leather armor must be made out of real leather, either light or thick heavy leather. Duct tape cannot be added to armor and/or along the edges. Chainmail and plate mail must be made out of metal and must be of a certain thickness. Armor must be constructed out of authentic materials. Armor must be attached to other pieces of armor and to the wearer with period materials as well; lace & string, buckles, ties, etc. No Velcro, tape, staples, etc. • Light leather with metal studs no further than 1 inch apart to create Studded Leather. • Light leather and 2/16+ inch thick leather plates attached and no further than 1 inch apart to create Brigandine. • Light leather with metal studs no further than 1 inch apart to created Studded Leather. • 4/1 or tighter pattern with a minimum of 18 gauge links. • Must cover more than 50% of the forearm between the wrist and elbow. • Must cover more than 50% of the leg between the ankle and kneecap. • Example, placing a leather brigandine over a chainmail hauberk. Base armor is that of the chainmail. Must be checked and approved. • Example, placing a plate mail breastplate over a chainmail hauberk. Base armor is that of the plate mail. Must be checked and approved. • Must be Full Heavy Leather or better armor. If a large percentage of the entire body is covered in armor with gaps no larger than several inches between each piece of armor or location covered by armor. 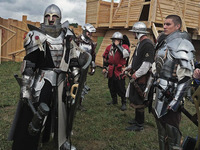 Example, a long sleeved long length chainmail hauberk with a helm, bracers, and greaves that cover the front of the leg and kneecap or a full suit of plate mail that covers almost the entire body. Must be approved by a Herald. • Must be padded quilted material or thick cloth gambeson. Must cover entire torso and either upper arms or upper legs; cannot just be a vest. Makeshift gambeson may be approved if material and thickness is appropriate. Armor worn over gambeson must be of Heavy Leather or heavier. Must be approved by a herald. • Aluminum is an unrealistically light metal. If a suit of armor, helm, or bracers/greaves combo are aluminum then it grants one less point of armor. The goal of this discussion is to give another chance to review, edit, and revise the armor rules of Last Hope if possible. A lot of opportunities were given during the 1.5 playtesting phase for players to get involved with helping with the armor rules and they chose not to... this is one last chance to help tweak this in a "rules edit" to see if there is a better way. 1) What joints are required for full coverage, and what it means to be "covered" there. Specific joints for target areas will clear up a lot of confusion - does full coverage of the lower arm mean elbow or hand, or both (I vote both so harder to achieve). Is a bracer that extends to cover the elbow good, or do we mean elbow cop? 2) Layering can only be used to go from basic to complete, and must be no less than 1 level lower - so chain and leather, plate and chain, no plate and leather. Going heavier is fine. Those minor changes I think will help clarify the rules for everyone. I offer a complete overhaul that should meet all parameters while simplifiing the process and from a mechanical view, make for healthier math in the "weight classes"
This change makes math easier. with this math, add up locations is easy, and gives us a clear "weight class" so to speak without over doing heavy or gimping light armor. if a player is wearing a full suit of basic coverage light armor (we will get to what coverage entails later) they have 5 armor, Medium 10, heavy 15. This puts us within our desired range of 18 armor cap, with wiggle room for coverage/layering/padding bonus. This system also easily handles mixed armor types and armor of any combination. if a player is wearing a mix of medium and light armor(not layers) they will naturally fall between 5 to 10 armor, medium and heavy 10 to 15 and if they mix heavy and light the same will happen. the purpose of coverage is stress realistic armor functionality, but we also have to accept that this is a game, a fantasy game at that, so we need to make a minor compromise here to streamline this process and make it both FUN and EFFECTIVE. The first step is to clearly assign, in a simple manner, all the joints to one of the 10 locations. we will start with the limbs first as they are the easiest. #note# This divides the limbs into natural visual and mental sections, we do assign the shoulder to the upper arm instead of the torso because the torso and head are a vital area and will have a special relationship with the neck, also this organization keeps the system simple. The neck has 3 sections, throat, spine, sides, and is a shared joint for both the head and torso. This allows for the system to accomodate the many different types of helms, gorgets, bevors, drapes, fins, ect that are used to protect the neck. This also stresses armoring the head torso and neck as the vital targets they are because the neck coverage can qualify 2 locations for a coverage bonus. Currently the system's greatest weakness is what consitutes as coverage. while the complexity of it allows for more indepth review, it over complicates it, adding alot of time, and leaves to much to the individuals opion, resulting in vastly mixed results. for example, at the august event, without me offering any argument about my armor totals, the first staff member gave me a 6 then refered me to another who gave me an 8 they both talked then sent me to a herald for a double check and i ended up at 10. This could only be caused by the coverage rules and each person had a different take as to what that meant. So the key is to simplify coverage dynamic so it is easier to identify and more consistant. With the system i am about to explain, it should be simpler, and even if there is some slight variation in opinion, the armor count will be less effected. we do this by taking the coverage points off of each individual limb and make them thier own seperate bonus. Potentially only a 1 or 2 point spread as oppsed to 10. #note# so a person in only a light torso armor has 1 point, only torso medium 1 point, heavy torso 2. this rule is a required compromise or the light armored players get shafted. #note#With this system, mixed armor is accommodated for without exceeding armor cap, players are rewarded for wearing more full and functional armor while reducing confusion and point spread, layering and gambeson are rewarded, math should be far easier, reducing overall time, and players are allowed to customize their armor. we also have a healthier armor spread with a clear indicator, while still rewarding players for light armor, who are currently being hurt pretty hard by the system. a player in a full suit(10 locations) of light armor will have 5 armor, if they have good coverage and padding/layers they could have up to 8, same with medium and heavy so the armor spread would be 5-8, 10-13, 15-18 respectively and that's just the traditional armor, mixed armors will still fall into their appropriate place on this scale. I like where you're going with this overall. Brogan and I were chatting about potential system as well that you may find interesting, but I'll leave it to him to post it up. Leather is light and Chain is medium. If someone wears a chain hauberk and then wears a leather piece over the top would that would be considered layering and would get them 1 additional point? In my thoughts if someone is wearing good leather over or under good chain it should function the same as heavy armor, so if they cover their whole body in chain and then cover that chain with leather it should bump all locations up to 1.5 as heavy armor instead of all locations being treated as 1 point and then giving 1 extra point for layering. I really do like the thought you've put into this and it already addresses my biggest gripe, (.25 armour locations). I see why you would say that for layering, but my concern is 2 fold. That becomes a bigger concern than having more armor locations and kinda replicates the current coverage effects each limb issue, because the more bonus you get from the layers the more rules we have to apply to keep it balanced. You feel me here? What stops that from becoming the same as the current issue? I will say that the idea of layering increasing coverage level would be more appealing than increasing armor class. My th ought for layering is it should be rewarded nut not the focus, that's why it has to be at 50% not just each location. This basically is meant to account for the overall increased effectiveness of the armor, the lighter layers adding to the core armor. So if a player is wearing a medium torso armor, and wearing a qualified piece of light torso armor over it. They do get + 1 armor bonus which alone would make it equivalent to just a heavy torso armor yes, but in the long scheme that bonus will taper out in the heavy armors favor as more armor is added. This keeps emphasis on better armor class as per Ryans request while also rewarding players for focusing on vital targets. I would say my general goal was to keep things simple. I moved the majority of the core armor count to the armor class, which should be easy to count visually without any issue no matter who is looking. Then the more complex stuff is moved to a more general motif, with a smaller bonus so that if there is a discrepancy it is far easier to deal with and since there is less on th e line, judges can be a little more lax in thier opinion, because at worse they give a player 1 or 2 points to many instead of possible 9. And as a player a 1 point swing is alot easier to take in stride then say a 5. I think thats the gist of it. I may be wrong. I dont like it. The simplification is nice, but it goes back to larp armor rules and does not promote coverage. I put plate on my arms and legs, and I'm walking around at 9 points of armor? Add a padded vest over my torso and 10? Add cops, roundels, and a plate for a sabaton and now I'm at 12. All while my torso and head are wide open. So I'll be just as protected in my plate arm cannons, tassets and greaves as I would be in my full chain and splint right now. Its not bad system, but it goes backwards in advancing coverage and realism. The vital bonus was to address the fact your torso and head are the most important things on your body, and encourage people to cover them. The all targets covered to get a bonus was made to move people to completer sets. This wipes out both of them and would encourage the opposite in both. Well the true gap system that belegarth uses is the best way to promote coverage because it is real. But they don't have magic, and you can be slain in one hit, and death doesn't matter. We are a larp game. We have to remmber that. That's why I was talking about compromise, your character dies and that's it. Our first priority is to encourage armor. And since this is a fantasy larp, albeit a low fantasy larp but we have syndar and mordok so we also have to accommodate th one who wants some slightly more fantasia armor. You can't stress REAL armor to th e bank and then have a guy with a black bean bag kill you ( not that I'm upset about magic) we are a fantasy game. Some people want to be fantasy. The more we try to make things real, the more rules we will need. Th e more complex it will become. The current complexity overides all the realism you get out of it. I have my armor counted once last year and knew what it was all year, since the rules change I have had to have it counted every event, multiple times. When I talk to people, I feel that is the current feel. And I'm sure it has to get old on the staffs side. Constantly checking and rechecking armor. At first it was new. But it has been nearly a year since the change in October and people are still lost. It has failed, and can not remain, I want to hear ideas to make it better. Not just reason why my idea doesn't work.